Son Of Jim And Tammy Faye Finds His Own 'Grace' It isn't easy being the son of the disgraced evangelists, Jim Bakker writes in his new book, especially since he decided to follow in the family business. 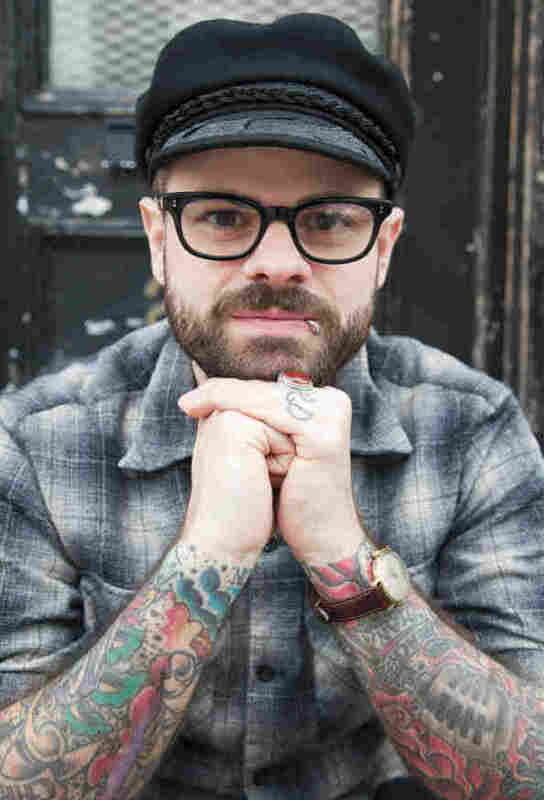 Pastor Jay Bakker co-founded Revolution Church in 1994 and now runs the New York City branch, which meets every Sunday afternoon at a bar in Brooklyn. Jay Bakker has a very famous last name. The reputation of his parents -- disgraced evangelists Jim and Tammy Faye Bakker -- usually precedes his own. That hasn't been easy, he says in his new book, especially since he decided to follow in the family business and become a pastor himself. Bakker co-founded Revolution Church in 1994 and now runs the New York City branch, which meets every Sunday afternoon at a Brooklyn bar. A church that meets in a bar is pretty atypical, but then again, so is Bakker, who counts Marlon Brando as one of his fashion icons and is covered in tattoos -- including one tattoo that reads, "Religion Destroys." "Religion can be a very dangerous thing," Bakker tells NPR's Guy Raz. "It's a constant reminder to me to be careful." 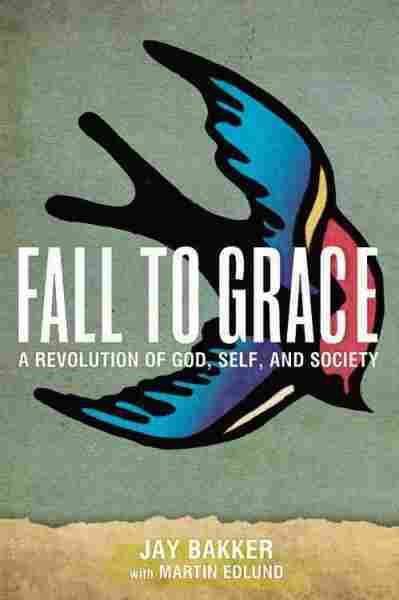 In Fall To Grace: A Revolution of God, Self and Society, Bakker makes it clear it's grace, not religion, that he believes in. "Grace is unconditional acceptance," he says. "It's just that moment where you're able to say, 'I am accepted by a power greater than myself.'" Bakker's unorthodox beliefs lead him to controversial social stances that have branded him as a heretic in many Christian circles. One of those stances includes fighting for gay rights. He believes gay marriage should be legalized and is very active within the lesbian, gay, bisexual and transgender community. The Bible, he says, has been misconstrued by many Christians and needs to be re-examined to include these important civil rights. "I believe that the church is unfortunately still the 'tail light,' as Martin Luther King used to say," Bakker says, referring to King's musing that religious communities usually seem behind on matters of social justice. "I'm hoping that we can become the headlight one day." You know you've reached a new level of fame in Ameri­can culture (or infamy) when there's a casting call to play you in a movie. In my case, it was a second-rate made-for-TV movie called Fall from Grace, starring Kevin Spacey as my dad and Bernadette Peters -- face painted like the side of a barn -- as my mom. Somewhere in Hollywood a bunch of chubby white kids lined up, hoping to get their big break playing the part of little Jamie Charles Bakker, son of disgraced tele­vangelists Jim and Tammy Faye. What those other kids might not have realized was that being the son of the picture-perfect Christian family was a role for me too. Twice a week I would don a child-sized suit, tame my cowlick, and brandish my jack-o'-lantern grin for an audience of millions on my parents' Praise the Lord (PTL) television ministry. The network's supporters were my extended family. All through grade school, my yearbook picture (no matter how humiliating) was mailed to six hundred thousand PTL faith­ful around the world. They knew of my birth even before my dad did. He was on the air preaching when the pro­ducers flashed the words "It's a boy! It's a boy!" across the bottom of the screen like a severe-weather warning. On De­cember 18, 1975, Hurricane Jay made landfall. For those readers who don't know my family story, or have assigned those memories to the junk pile of 1980s trivia, let me lay a little groundwork here. It's not that I take pleasure in retreading this territory (believe me, I don't). But I do think it's important that you understand what I've lived through to learn grace. My family set the standard for televised crack-ups. Be­fore O.J. on the interstate, before Michael Jackson dangled babies over balconies, before Britney went all bald and strange, there was the Jim and Tammy Faye "mascara melt­down." But prior to being pariahs my parents were pop-culture pioneers. They were the first people to bring down-home, family-friendly Christian worship into Amer­ica's living rooms through television. They paved the way for the best-selling mega-church stars of today. For good or ill, it all started with my mom and dad. And it all started humbly enough. In 1964, my parents made their first appearance on the Christian Broadcasting Network, the station of future Christian television mogul Pat Robertson. They debuted with a kids' show featuring handmade puppets: Susie Moppet (a Porky Pig bubble-bath cap refashioned with braids, voiced by my mom) and Allie the Alligator (a leopard-print sock with teeth, voiced by Dad) would sing Christian songs and explain God's Word. One thing led to another, and by the mid-1980s my par­ents owned one of only four satellite TV networks in the world, along with a sprawling theme park and the largest TV ministry the world had ever witnessed. At its height, PTL was carried on twelve hundred cable systems around the globe, broadcasting into more than thirteen million homes. Dad became a global figure -- a new breed of Christian businessman and a friend to presidents and movie stars. He convinced himself that it was all in keeping with God's plan. He told Time magazine in 1986 that if Jesus were alive to­day, "he'd have to be on TV. That would be the only way he could reach the people he loves." PTL spawned a family-friendly theme park, Heritage USA, which my parents constructed across an expansive 2,300-acre campus in Fort Mill, South Carolina. Only Dis­neyland and Disney World drew bigger crowds. The main difference was that everything in our magical kingdom was Christian-themed. Dad had the childhood home of his hero Billy Graham relocated to the Heritage grounds. There were daily Passion plays and a "Heavenly Fudge Factory." There was even a "Noah's Toy Shop" (run by a guy actually named Noah) that sold disciple action fig­ures and other Bible-themed toys. Both the rise and the fall of PTL reinforced the idea that God metes out rewards and punishment based on behavior. For the longest time it seemed that God wanted us to suc­ceed. Everything went right for the Bakkers. Until it didn't. The cracks began to show in January 1987, when my mom accidentally overdosed. I was eleven years old. We checked her into the Betty Ford Center (thus beginning a proud tradition for the Bakker family), only to discover that she was addicted to enough over-the-counter drugs to tran­quilize a gorilla. She'd been using them to cope with the stresses of business and stardom. The story was too tantalizing for the press to resist: the perky Christian poster mom was a drug addict! The media descended on us like something out of Revelation. Swarms of cameras surrounded the clinic. Media vans staked out our home. Photographers rented U-Haul trucks to use as step stools so they could take pictures over the walls and through the windows of our compound. The white sheets we hung in the windows to obscure their view did little to discourage them. From that moment on, we were no longer hosts of our own TV show but unwilling stars in everyone else's. Being a Bakker was a prime-time media spectacle, one we couldn't turn off. Things went from bad to worse in 1987 when the Char­lotte Observer broke the news that my dad had had an affair seven years prior with a comely Christian secretary named Jessica Hahn. The story was everywhere: CNN, Nightline, Johnny Carson. My parents forbade my sister, Tammy Sue, and me to turn on the TV, but that didn't stop us from catching Phil Hartman's devastating imitation of my father on Saturday Night Live (which included a scolding at the hands of Dana Carvey's "Church Lady"). Adding a sleazy taint to an already humiliating affair, it came out that someone from PTL had paid Hahn hundreds of thousands of dollars in hush money to keep the secret all those years. If God had favored us before, He now had clearly changed His mind. In an attempt to save PTL, my father turned the network over temporarily (or so he thought) to Jerry Falwell. Falwell had advance knowledge that the Hahn story was going to break and promised to look after things while my father rode out the storm. The man he chose to shepherd his empire turned out to be a wolf. Falwell immediately began de­nouncing my parents from their own pulpit. Others joined in on the chorus. "Jim Bakker is a cancer in the body of Christ," proclaimed Jimmy Swaggart to Larry King on CNN.2 Pat Robertson, who had helped launch my parents' career, would also play a part in its undoing. They got their just deserts, he pronounced. Falwell accused Dad of everything he could think of: not just thievery and having "an unrepentant heart," but of ho­mosexuality too. As you can imagine, that last charge was especially damning in evangelical circles. We lost the TV network, Heritage USA, and our home (which was owned in the name of PTL). To add insult to injury, Falwell auc­tioned off what he considered our most humiliating personal items in front of the media: a mini go-kart, my parents' bed, and the notorious "air-conditioned" doghouse. From the perspective of an eleven-year-old boy, the free fall was dizzying. One minute I was the scion of a famous family. The next I was a social leper with the most noto­rious last name in Christendom (besides Iscariot). I was so radioactive that my friends were literally forbidden to play with me. Unfortunately, my faith was cold comfort in those days. My parents weren't fire-and-brimstone types, not by any means. (They signed off every episode of their show with the catchphrase "God loves you. He really, really does.") But they did subscribe to the standard-issue Southern evangelical be­liefs of the day. Heaven and hell were the carrot and the stick of our faith. It was turn or burn, baby. Either you followed the rules or you went straight to H-E-double-hockey-sticks. I didn't have grace to lean on then. I didn't know where these rules came from, or what to do with them. Despite spending my whole life in church, I had hardly opened a Bi­ble. I hadn't read Christ's words highlighted in red, let alone Paul's letters to the Romans or Galatians -- books that might have given me some comfort and perspective on grace. My family crises were compounded by my problems with classwork in junior high. I had severe dyslexia, a condi­tion that would go undiagnosed until seven years later, long after I'd dropped out of school. It made learning virtually impossible for me. And when I couldn't keep up, I gave up and did what any frustrated son of fallen televangelists would do...I rebelled. In cigarettes and wine coolers I finally found something at which I could excel. I was only twelve years old, but they were easy enough to come by. When I started partying, I told myself, I'll just have wine coolers. It's cool. Jesus had wine. But I always feared there was more to it. You see, the way I was brought up, sipping a wine cooler wasn't just a youthful indiscretion -- I was sipping strawberry-flavored hellfire! It seemed there was always someone around to remind me of the flames nipping at my heels. On one occasion, I was at an outdoor party in high school when a girl I went to Christian summer camp with drove by and saw me holding a bottle. She pulled over the truck she was driving, rolled down the window, and yelled: "I knew you wouldn't last!" It was straight out of the movie Saved! Today I have some ap­preciation for the complicated mix of guilt and anguish that drives someone to lash out as she did, but back then it was just a punch in the gut. It's not that I didn't try to get right with God. I just didn't know where to start. Throughout my teenage years I got saved what seemed like every other week. I'd come down to the altar call with the rest of the guilt-stricken and confused junior high kids, bow my head, close my eyes, and shazam! -- wait for God to transform me. It never lasted, of course. Not for very long, anyway. Before I knew it, I'd do/think/feel something sinful and start looking for the next opportunity to bleach my soul clean. Instead of bringing me back into the fold, my guilt -- reinforced by the judgment of those around me -- drove me further from the church. If a lousy Bartles & Jaymes wine cooler was all it took to separate me from God, then I was gonna accept my one-way ticket to hell... Reserve me a seat in the bar car! If my struggles with school and faith weren't complicated enough, there was still more Bakker family fun to be had. In December 1988, almost two years after the outing of my dad's affair, a long-running federal investigation into the fi­nances of Heritage USA went public. The accusation came down to overbooking: PTL had sold more lifetime mem­berships to Heritage USA -- complete with the promise of three nights' lodging -- than it could possibly accommodate at once. Dad was indicted on twenty-four counts of fraud and conspiracy. The trial began with a bang in August 1989. Three days into it, my dad had a Xanax-fueled emotional breakdown in front of the press. Dad was paraded, sobbing and shack­led, through a gauntlet of TV cameras to the mental ward. It may have been great television, but it was torture for me to watch. United States vs. James O. Bakker was about more than one organization's sloppy accounting or one man's malfeasance (though there was plenty of both to go around). The whole era of televangelism was on trial, and my dad was already guilty in the highest court in the land: the court of pub­lic opinion. The judge (nicknamed "Maximum Bob" for his draconian sentencing) made it official when he sentenced my dad to forty-five years in prison. He would ultimately serve five, but it was long enough for my parents' marriage to unravel. The very night of my dad's sentencing marked the be­ginning (or radical acceleration, anyway) of my own down­ward spiral. I was thirteen years old when some older kids decided to take pity on me and take me out partying. I never looked back. Wine coolers quickly gave way to stiffer stuff: vodka and Gatorade (bad combination), pot smoking, even gas huffing. By the time I dropped out of school in tenth grade I was punching above my weight (using acid, psyche­delic mushrooms -- whatever I could get my hands on). It went on like this for years. Separation from my dad was my excuse for drinking, but his release from prison five years later wasn't reason enough to quit. If anything, his being out made things harder as we tried to navigate new dimensions of our father-son relation­ship. A lot had changed in five years. When he went in, I was little Jamie Charles: thirteen, chunky, and scared to death of losing my dad. When he came out, I was Jay. Just Jay, thank you very much: eighteen, pierced, and a raging alcoholic. Needless to say, things didn't go smoothly between us. Dad did what he could to steer me back toward Chris­tianity. When all else failed, he shipped me off to Arizona to a young ministers training camp called Master's Commis­sion. As advertised, it was all about control. They had been forewarned about what a hellion I was, so the counselors (all in their mid-twenties) mapped out roles for dealing with me: One person would be good cop; another the bad cop; a third the flirtatious fellow rebel. It was like a bad John Hughes movie, and I saw right through it. I did meet two kindred spirits in the place, however, and we decided to break out together. Mike Wall was a tall, charismatic hard-core-punk kid; Kelli Miller, Mike's part­ner in crime, was a free-spirited hippie throwback. They had the idea of starting a ministry that would cater to skater and punk kids in a language and style they could understand. With me as the requisite skater brat, we had our outcast bases covered. For a while, it worked like a dream. We bailed on Master's Commission and started putting on punk shows under the name Revolution Ministries, using great local Phoenix hard-core bands to attract a crowd. We took no small amount of pride in the fact that our preaching was the wildest part of the night. We had all sorts of antics: Mike would smash TVs with a sledgehammer; I'd pretend to puke onstage. We got ourselves banned by some local youth groups, which did wonders for our street cred. I was in so much personal pain that I had no trouble relating to the suffering of the troubled teens our ministry attracted. Unfortunately, I wasn't ready to change. Not yet. I kept slipping back into old behaviors. I resumed partying with a vengeance and left Revolution behind. My "weekend benders" soon stretched from Wednesdays to Mondays. I began blacking out every time I drank. If there was one thing I was sure of, it was that God was through with me: I had even failed at the burnout-and-misfit church! 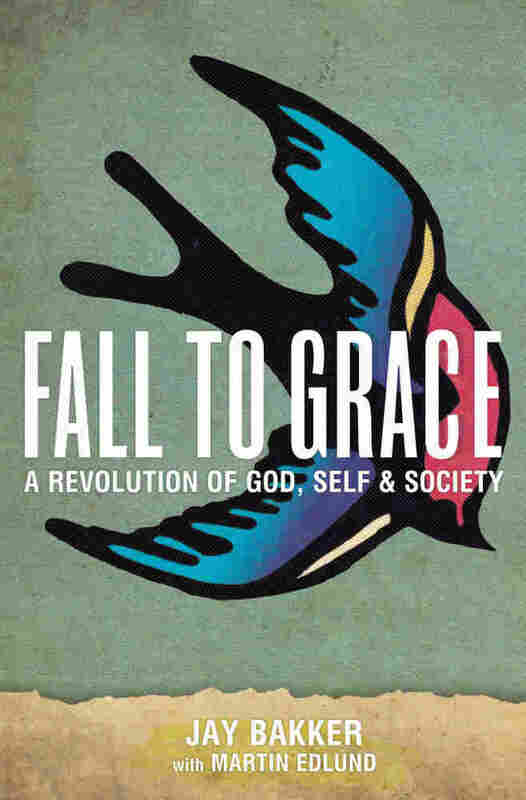 Excerpted from Fall to Grace: A Revolution of God, Self and Society by Jay Bakker with Martin Edlund. Copyright 2011 by Jay Bakker. Reprinted by permission of FaithWords, a division of Hachette Book Group Inc.